This is my Toaks 650 cook kit setup. I made the pot stand myself so that it would fit inside of the mug. Toaks do sell one too but total cost with shipping to Sweden is too high and this thing is basically the same. The weight of this kit is ca 220g and packs down small. The windscreen and the spoon doesn’t fit inside of the mug like the rest of the kit but that’s not a problem for me. The reason I carry a fire steel and not only a lighter is because a couple of years a go my Bic lighter died on me. It was the second day into my 7 day trip and some pretty nasty weather decided to show up in the morning. I had my lighter inside the backpacks hip pocket which is mostly waterproof apart from the zipper. Water came in and soaked the lighter and it wouldn’t start up again for the whole week. Luckily I’d packed my fire steel, actually almost forgot it at home, and from this day I don’t go out on a trip without it. A couple of years ago I found Colins Ibbotsons page http://www.tramplite.com/ and read about his Tramplite shelter. It looked very interesting but it seemed more likely to meet a unicorn than to get my hands on one. So I let the thought of the shelter go. 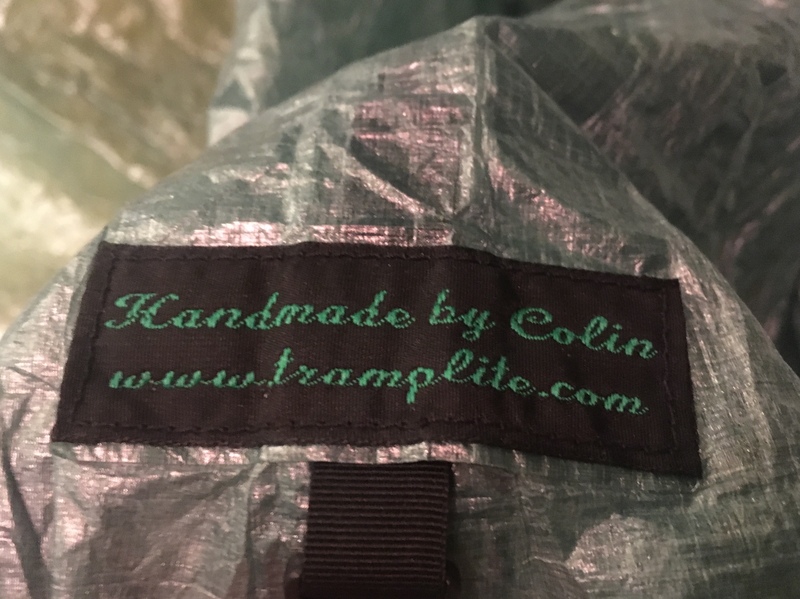 Then in the winter of 2016 I saw on twitter that Colin was working on his shelters again. I sent him a message and asked if he was taking orders. Of course the books where full, but he promised to put me on the reserves list. Last year you contacted me about a Tramplite shelter and as you would get one from the next batch I’m checking to see if you are still interested? Was I still Interested? Oh yes! So now, finally I’m holding my new Tramplite Shelter in my hands. Trip report of my solo hike in the remote area of Hornstrandir, north western most part of Iceland in August 2017. This video shows the fourth and fifth days of eight days. This video shows the first three of eight days. Got on the bus with time to spare and rode to Landvetter airport, Gothenburg. Smooth flight as always with Iceland Air and we landed right on time at Keflavík International Airport. Transfer bus in to Reykjavík and started to hunt for breakfast and place to store my bag until I got access to my room. I was also calling the local gas station in Ísafjörður to make sure that they had alcohol for my stove. Had e-mailed them previously but not reply. I got a hold of them and they put a side on bottle for me. Problem solved. The information center had a service to store your bag for 1000ISK so I took up on their offer and started to walk the streets. The rest of the day I was having a good time in Reykjavík, visiting Micro Bar, best beer place in Iceland, where I met a few people and chatted away with till late. 5th of August – 6:30 AM , Reykjavík Airport. Finally off to Ísafjörður! Reykjavik Airport is small but everything was flowing smoothly and we departed on time. Flight time 40 minutes. The 5th is a bank holiday in Iceland so that would mean that I was stuck in the small town for the day. No boats. Coffee, food and rest was on the menu. If you go here you should definitely visit the old bakery and for food there’s this fish-place with all you can eat (didn’t visit) but otherwise a place called Húsið (the house) which I cannot recommend enough. Ísafjörður is a picturesque town with a great backdrop with the mountains surrounding it and the people are very friendly. There was quite a few tourists here that came in with cruise ships so don’t expect it to be empty and you might have to fight your way through to get a table at times. 6th of August – 0900 hours, adventure time! I was at the docks early, slept kind if good but I guess the excitement got me waking up early, even before the alarm sounded. Packed and ready from the night before I had a quick breakfast and went to the old bakery to grab a cup of coffee. Being a bank holiday yesterday, there was a lot of people going with the boat together with a lot of supplies for their summer homes. The boat was packed to the limit, 16 people. The seas were rough and some people were ill.
First stop was Sæból, took almost 45 minutes to get everyone off the boat and on to land with their supplies with the Zodiac. We also picked up three Icelandic hikers that had been out for eight days. I took the opportunity to ask them a thing or two about the area and the weather. Landed on the shore of Látrar at around 11 AM and I started walking on the beautiful beaches towards Sæból (yes, I went back) getting attacked by Arctic terns . These are very territorial and will dive bomb you until you’re out of the way, “Welcome to Hornstrandir”. Overcast with a steady 10 degrees Celsius, perfect hiking weather. There was also low tide which was perfect for this section. After the beach walk there came a part which was just walking on stones, was slow-paced because some were slippery and some loose. Just as I got eyes on Sæból in the distance, coming around a corner I found a metal ladder. I had been told about this part from the hikers that came on the boat but I couldn’t really imagine what it would be like. The ladder went straight up 90 degrees and then came to a chain hanging of the cliff. It was really steep and with a full pack this was interesting to say the least. This was climbing. Fortunately enough there was no wind, or very little, and no rain. Otherwise I’d turned back. I reached the top after some scary moments with rocks coming loose and slipping on gravel, my heart was racing when I came to the top and I was pumped with adrenaline. I wouldn’t do this part again with a full ever again even if I got paid. My pack is light but someone coming with a 20kg+ pack wouldn’t have a great time here or might not even make it at all. I sat for a good 5-10 minutes and then got back up on my feet and started moving again, grassy slopes with a well beaten track, reached Sæból in no time and started climbing the mountain Darri to go look for the old British radar station. I had lunch on my way up to the top. Just as I reached the top, the northern winds had brought big clouds in over the area so visibility was at times less than 20 meters but usually around 50. I searched but couldn’t find it. Didn’t want to go exploring too much because there are overhangs here on the cliffs and in the clouds it’s really hard to see what’s what until you’re standing right there. I went back down again a little sad that I didn’t find it and made the climb ‘for nothing’. Started walking towards Hesteyri where I would make camp for the night. This route was really nice going past an old church, climbing next to a small waterfall and then up on the plateau, Sléttuheði, where you could see quite far south where the fjords makes up for a spectacular view. Saw my first Arctic fox too just before crossing a stream. It was quite curious about me and came as close as 2 meters before I started walking again. Everything is alright, my body feels good. A beautiful morning, the wind was blowing gently through the whole night, campsite sat quite high above the sea, no condensation anywhere. Pack and go! Started with a nice ascent giving a good overview of the campsite and Hesteyri. There was a few people walking between the houses here, probably going to get some food. They even offer accommodation here along with a breakfast buffet if you want to pay for that. Beer and pancakes too. I had non of this, stuck to my strict diet, haha. When I came up on Hesteyrarskarð the wind picked up and with windchill I guess it was not much more than 1-2 degrees at times. It was cold so that the few stops I had to do like tie shoes and have a quick snack, I really had to find a good spot to get out of the wind but even with that I was shivering. Saw the first snow on the hike here. Coming closer to Látrar I got a great view of the entire valley and Straumnesfjall which was the next target with the old american radar station H-4. The sun was up at this point but low clouds where closing in. Crossed Norður Aðalvik with it’s sand dunes and bogs. Caught up with an elderly couple from Wales that had come in with their sailboat yesterday. We had a quick chat and then I started ascending the south path of Straumnesfjall. The men who lived an operated at H-4 must have been super fit climbing these paths with supplies and gear. Before I managed to hit the top the clouds where reality, walking in a glass of milk again. The wind picked up and the visibility was anything but good. At times you could see 100 meters and then the next sub 20. When I came up to a “cross-road” I took a left and realized that I probably had turned too early. A quick map check, no landmarks, but gut feeling told me it was wrong. Then, out of a sudden the clouds gave me some slack and a big ghost house was in the distance. It scared me because with the wind the clouds moved so fast it just came and went out of nowhere. Almost like a mirage. I didn’t see this house on the map but knowing before I left, when I did the research, that there were a few houses spread out on the area connected with roads I made my way towards it. The clouds covered it again and I just walked towards where I saw it and then… There it was, a single building in the middle of nowhere, scarred by time and the not so gentle Icelandic weather. Filled with new energy I pushed out west again looking for the main road and found it shortly after and turned north towards the main buildings. It took some time and I saw a few more houses along the way which like the previous one just popped out of the fog on short notice. It was closer to 1 PM when I reached the radar site, covered in the clouds, quite creepy place with the fog. Felt like something out of a movie. I stopped for lunch and found out by accident that this place actually hade service so I called home via FaceTime, which was choppy and not the best. During my lunch the wind had moved all the clouds and the sun was out. I took shelter in one of the aisles and tried to dry out shoes and socks. After I was done I made a “navigational error” and went down the east side, there’s no real path here but it’s there on the map. It was a great place but very wet. It took me longer than expected but with the sun out it was still a nice walk downhill. Instead of setting up camp at Látrar which was the plan, I didn’t really remember my plan, probably due to the nice weather and the mindset of ‘keep pushing on’. I ended the day over at Fljótavík. The Ascent up to Nónfjell was nice and offered no real paths so that was the real first navigational challenge but soon found a good path to follow. The Descent however, was really steep and I didn’t enjoy that part, slippery and some climbing at times. Found a good campsite and could see another tent about 2-300 meters away from me. I miss Emelie and the kids. Woke up around 3 AM from the sound the rain made when it hit the tent. Cuben fiber is quite loud if it’s pitched right, more or less working like a drum head. I wasn’t cold but I could feel the moist that was in the air. I went back to sleep and woke up around 10 AM and contemplated if I was to get up and hike out in the rain. I decided to hit the mental snooze button again as I was one day ahead of schedule. Had breakfast/lunch around noon. I was thinking of taking a zero day but I thought it to be too lazy for the third day. 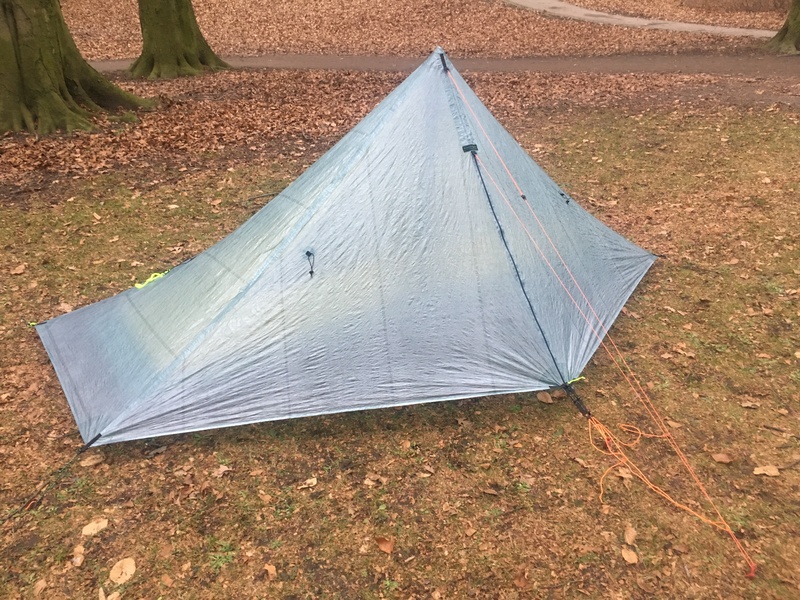 Broke camp quite quickly, put my HMG Ultamid 2 in the mesh pocket on the outside of my ZPacks Arc Blast with the hopes of the rain letting down later in the day and maybe even get some sun to dry it a little. I walked north-east towards the river crossing marked on the map, Atlastaðir. From where I camped I had to cross a small and shallow lake. Soaked. Once I got to the river crossing I decided on the best place to cross. There weren’t really any wide parts here and I could see that the water was moving quite fast and the rain that had fallen through the night probably didn’t help. I picked the best place that I could see and started crossing. As soon as I hit the water it was knee-deep and it looked to stay like that so I carefully continued. That’s when it happened, just past the middle it went waist deep and I could feel the current grabbing the back of my pack. I was about to go swimming! I hastily checked left right for the best ‘exit’ if I’d fall and thought to myself, this is it. At that point adrenaline and anger kicked in about my own stupidity and I managed to push my trekking poles deep in the soft lava sand and they sunk like in quick sand. I leaned forward as much as possible and managed to get my right foot on more solid piece of the sand bottom and pushed out. Close call! I should have known better and that glacial streams drags a whole lot of stuff with them and makes the bottom act like quicksand. After I got up I checked my pockets that I still had everything and that my map and electronics weren’t swimming in my hip pockets on my pack. Luckily enough everything was dry. I brought out the map and decided not to cross further down but instead take the detour around south-west of Flótjsvatn via Glúmsstaðir ruins. This whole area around Fljótavík is known for being wet and it held true to this. Not a dry spot anywhere until I started climbing up towards Þorleifsdalur. There was no real trail here but at times you could see that people have been here, the odd footprint here and there. I started my ascent towards Þorleifsskarð (skarð = gap/dent) which is more or less just stones everywhere and the trail is quite hard to follow especially with some fog/rain. Tip of the day is to follow the map blindly here and just go straight up the middle, even though it looks like it’s almost vertical climb from afar. The trail is there, and it’s steep. Half way up I had to put away my trekking poles and strap them to my pack. I needed both hands to climb up onto rocks and clinging on the side of things to be able to go upwards. The descent on the other side isn’t that bad and it’s an easy walk to Almenningarskarð which is also quite steep. Ascent towards Hlöðuvik was not bad at all and the view was great. When I came down to the beach area I caught up with two Germans that was on the beach taking pictures of the drift wood that had piled up. We walked together for sometime until they stopped again to take more pictures. I was getting cold so I headed for the campsite. There were already two more tents here when I arrived, an Italian couple and a solo hiking Canadian. Apart from us there were also 2-3 Arctic foxes that were very used to humans. They went and searched around the tents for food and some of them even more brave, had a quick peak into them too. I stored all my food and trash bag inside my pack that night. Here the wildlife was great, apart from the foxes I saw a lot of different birds and even a seal swimming next to the shore. I got up in time this morning, around 9 AM. There was a light drizzle and I was sitting inside the tent boiling water for breakfast. The camp was empty when I packed my stuff. I started walking east towards Buðir and the first ascent of the day. I caught up with the Germans and Italians after 20 minutes and took rear place and followed their (slow) tempo up hill. At the top of we came across an Arctic fox. It hung around for a few minutes before it headed up to the peak to the north. The group stayed there and I walked a head because the wind was quite strong and I was getting cold. The hike towards Atlaskarð was interesting with the low clouds giving very bad visibility and I lost the trail a couple of times but found it soon again. Due to the recent rain and the bad visibility I changed my route and decided not to go further north and around Hælavíkurbjarg (which was good). I met a solo hiker when I started my descent from Atlaskarð and she said that the weather was much better just a few hundred meters down the hill. We talked for 5 minutes before going our separate ways. I had a break at Rekavík bak Hófn on the beach when the ranger came up to me to say hello. She was very friendly and asked where I’ve been and where I’m going etc. She told me that it was good that I avoided the Hælavíkurbjarg route because in the fog and rain it’s quite dangerous. She also told me that Bjarnanes and Smiðjuvík where I had plan to go was just about as soaked as Fljótavík so she recommended me to stay an extra day in the Hornvík area to explore in stead. Good information. Icelandic art. You climb up the rope that’s on the right and down the other side. The entire Hornvík bay is very beautiful with the rocks coming out of the water like teeth and with The Horn or Hornbjarg in the distance. I arrived at Hófn and the weather was clearing up, early night. Hófn is a very luxurious place and the rangers house even have a WC that’s open for you as a hiker. It doesn’t get much better than that in the back country. However the place smells of rotting seaweed and during the day it has a lot of flies. In the evening and night they’re all gone. Waiting for better weather to go to Hornbjarg. Woke up early because the tent was too hot. The sun was already up. The night had been cold though, damp. I got up and threw out all the wet things I had in my pack and hanged them to dry. It didn’t take too long to get that sorted and they were soon dry. I headed off towards the stream Kýrá, which essentially is a waterfall. My shoes and socks were dry, a few minutes later it was time for the first river crossing… So much for dry feet. Easy to cross, the water isn’t higher than your calf. Hófn campsite is located on the right. You can see a bright dot there. I took the west route up to the horn and then following it around to the east and south. The views were just spectacular. The sun and blue skies made the day even better. Couldn’t have hoped for any better conditions for this part. I had two things on the trip I really wanted to see and that was this and the H-4 radar site. I called home from the top of Miðfjall the only place with service around here. Showed the panoramic views and was just happy having contact with the outer world for a while. Pushing the “OK” button on the Spot Gen 3 helps too, it’s psychological in a sense that you’re still here. I got told that the other day my ‘camp message’ hadn’t gone through and there had been some talks back home about what could have happened until I signed in the next day. This wasn’t the Spot’s fault but human error because I think I turned it off by mistake thinking the messaged had been sent. Made my way back down south and had lunch at the campsite close to Hornsé waterfall. Had a fox sneaking on me begging for food. They’re kind of like cats, sitting there looking pretty, praying on your conscience to feel sorry for them and throw them something. It gave up after 5 minutes but kept coming back every now and then. At the end it settled with laying down on a piece of grass on the high ground to my front and kept me under observation. Went back to Hófn campsite and took a picture of this Icelandic natural art on the way. I named it, Dog eating food. As I came back I found a spot where there was still some sun and pitched the Ultamid and just sat in the grass having a cup of tea and enjoying life. Talked to Casper and Emelie today. Will add some more luxury and listening to some music for a little while. A sunny morning once again. The night was cold. Hófn is trapping in all the cold and moist air like in a kettle. Had to sleep with everything on, even my down jacket as an extra blanket. Talked to a few others and they have had the same experience here during the night. Wasn’t really sure what to do today but on my old route I was to go by the lighthouse at Látravík directly east from Hófn. Unfortunately it closed on the 7th of August but otherwise they make pancakes and sell them for a fair price. I still went even though they weren’t open for business. The other reason besides seeing the lighthouse, was to walk on the only real marked trail in Hornstrandir. Hófn to Látravík. The ranger told me so the other day and that made me want to go even more, just to have been there and done that. The trail was indeed marked, to a degree. Some stakes had been smashed down into the rocky ground. Some where only 20cm high but others were almost 1.25 meters (my trekking pole length). On the western side of the Kýrskarð the wind was completely blocked and I was sweating like crazy. But as soon as I crested the wind was really blowing again, 15-20m/s. A rocky descent down towards the lighthouse but easy walking. I stopped halfway down the last hill and had a good overview of the lighthouse and the horizon. Dried my socks in the sun and had a snack before going back to Hófn. In Hófn for the last time. Decided to have lunch at the one and only picnic table. After a few minutes a guy showed up, trying to escape the flies (there’s no escape during the day). He introduced himself and asked if he could sit down and I said yes. He talked about what he did and how he’d come here to Iceland and Hornstrandir. He was very ill-prepared and didn’t have proper equipment if the weather would turn bad. He didn’t have a map, well, he had a “map” that was printed on a buff that he got for free from a lady in a store, where he bought one of those popular Icelandic sweaters. She gave it to him thought he’d need it, no trail markings or nothing. I guess this is the magic of internet and the easy spreading of images from “cool areas” that make these idiots visit them. The ranger told me that they’d even rescued two people around the 7th of August. They’d lost half of their gear, didn’t have a map and didn’t know here they were. Nice. Hornstrandir is no playground I can tell you that much. I left in anger, going south towards Veiðileysufjörður and I cooled off only after a kilometer or so. The climb up to Hafnarskarð is easy and you get a good view over Hófn. This place is very nice and there’s a lot of small glacial streams where you can get water, cool yourself down or just stay and look at them for a while. The closer I came towards the skarð I had to cross more and more snow patches. At first only 10-20 meters. Then 50 meters and even this one above which I guess was around 100-150 meters before reaching the top. Here at the top there’s service again so I got to call home but it wasn’t that good so I was breaking up a lot. Going down towards Veiðileysufjörður, my pick up location, might have been the most beautiful place on the whole trip. Down at the camping site there was quite a few people. About 10 of them waiting to go on the boat and four tents. I guess the trick here is to come early in the day because there are not that many places where you can pitch your tent. Everything is sitting on a slope and there’s quite many rocks which makes it hard to pitch even a small tent. I was lucky to find a good spot. Talked with Emelie and Alma. Slow day. Slept in and no rush to do anything. My left heel was hurting a little from the descent yesterday. Zero day. I mostly kept to myself but right before noon a couple from the Netherlands came to me and started chatting. They were really nice and we sat and talked the whole day until they were to get on the boat. I was told from before that there might be a slim chance that I might get on the boat and back to civilization a day early, rather than just sitting here for another day. The boat came in and one of the rangers who was leaving the area, closing up for this season, asked if there was room for me. Noup, full. I had visualized in my head, pizza or hamburgers with a cold beer. Wouldn’t have any of that for this evening! I went back up and pitched my tent in the same place again. Off the boat came a couple from Canada and we started chatting and they wanted to know about the trails etc. We ended up talking for many hours about everything from their studies on Lynx, Bobcat and primates to traveling and general everyday things. I went to bed around 10:30 PM and that’s the last time I saw them. These (new) socks didn’t survive Hornstrandir. Not buying these again. Last day of the trip. Sun was up again, hot tent. Dried out everything I had. Would make no sense to bring back wet stuff with me if I didn’t have to. I didn’t feel like hiking at all but I got told last night that I need to do some hiking today. So with that in my head I looked at the surroundings and on the map, Karlstaðir looks ok. I’ll just go and have a look at those ruins. My legs were slow, my mind was some place else rather than on the beautiful scenery. Not until I crossed the water over towards Karlstaðir my body went into hiking-mode. I picked up the pace and when I got better eyes on Karlstaðir I saw that the place was full of Arctic terns… Not going near them if I don’t have to. I was thinking if I was to go back but then again came that feeling, need to do something useful on my last day here in Hornstrandir. Tafla, 402 meters high, right next to me – Yeah, let’s do that one! The climb was steep, there are no routes here so I just winged it. Took some time to get up there and was feeling my heel a bit so I stopped shy of the highest point. Took a breather and then headed north to link up with the trail I walked down two days ago. On my way there I met up with a bird that I think was a Golden plover. It sings in a way that you can quite easily mimic with just whistling. I started to whistle and it responded every time. It started following me for about 500 meters or so, talking the whole time. It was fun and kept me distracted. Feeling as one with nature. As soon as the descent started it didn’t follow me anymore and I soon hit the trail and was back on the campsite in no time. The boat came after a few hours and I was on my way back to Ísafjörður. The boat ride was interesting. We picked up a few people and almost hit the pier because the sun was so low that the captain had it in his eyes, close call. Just before we came in to the harbor the engine stopped. Out of fuel… Well isn’t this a good way to end a trip? They pumped fuel from one tank to the other and with a slight engine issue afterwards we were on our way back to the safety of land. A quick goodbye to the very friendly guys on the boat and back to take a shower and then get some hamburgers over at Húsið. Hornstrandir, was an interesting place. The trip was interesting, exciting, scary and very beautiful. I don’t think I’ll be returning to this place anytime soon but I’m glad to have done the trip. Hornstrandir was great, the weather was as kind as Icelandic weather can be, in that area. The hike was interesting, fun, scary and offered very beautiful scenery. Done a lot of recording and now comes the hard part with choosing, cutting and colour grading everything. Stay tuned for a written trip report and some pictures during this week!